It would be great fun to carry out a guerilla action, which could go legit later. 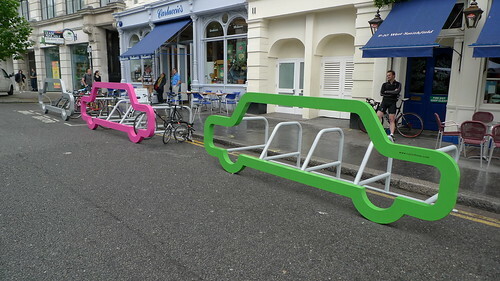 First apply for a residents parking permit, then get a Car Bike Rack from Cyclehoop, slap the parking permit on it and park it in a residents’ parking bay, then every few days move to a new parking space along the street. OK, not everyone who wants to leave their bike outside in the open over night, so there is the Copenhagen urban camouflage solution for covered parking (I am not suggesting using those colour schemes), but I am sure you could get one modelled on a large SUV, if you live in the New Town and want to fit in. Should the City ever get around to Pay-as-you-pollute parking permits for Edinburgh, you could even get a rebate on your parking permit, for being green. On a more serious note, I understand that Edinburgh Council is now considering on-street residents’ cycle parking. So who knows, some of these options could yet become available. If that comes off, then what would be next? 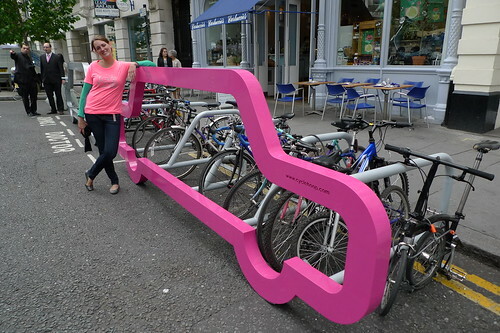 Maybe a few of the more progressive cafés and shops in Edinburgh could be persuaded to get Car Bike Racks from Cyclehoop and put them outside their premises. That would be such a refreshing change, as well as good business sense, after all do you want one customer who arrives by car or ten who arrive by bike? In the mean time, can I have one of these for Christmas? Are our streets for people? More space for bicycles to park needs to be created. You might not want to leave your bike there overnight, but certainly every cafe should do this. Old age & treachery will always defeat youth & skill.